Richard Keogh made his 600th career appearance. Richard Keogh said he was pleased to be able to look back fondly on his 600th career game after Derby County beat Wigan Athletic 2-1 on Tuesday night. The Rams came from behind to win the game and end a four-game losing streak, also scoring their first league goal since that run began. And defender Keogh was happy to mark his landmark game with a much-needed three points. He told RamsTV: “It is great that Scott Malone managed to get the goal there at the end to help me remember it a bit better..
“I know how hard that is for any professional player to play one game. I know what they have to give up and the drive they have to have to play one game, so if you told me as a young kid I would reach 600, I wouldn’t have believed you. “I have got a little bit left in the tank yet so hopefully I can get a few more. It is something I am really proud of and one I will remember for sure. “It was just nice that we could get the win and I couldn’t have asked for much more really. The most important thing for me was winning the game and that was all I focused on so it was just the icing on the cake to know it was my 600th game. Gavin Massey had put Wigan into a first-half lead but sub Mason Bennett's spectacular equaliser was followed by Malone's winner on 79 minutes, Derby's team spirit shining through to grind out the win. Keogh said: "We showed great character to come back and there was a bit of relief in there as well after the run we have been on to get the three points. Wigan are a good, tough team and they made it difficult for us. “I thought we started the game brilliantly. The goal was against the run of play but we showed that togetherness. “When you show that and you never give up then you give yourself the best opportunity. I think in the end we deserved it, we were really trying to go for it and it was a great three points. “It was an incredible goal from Mason Bennett to get us level too. He has done so well when he has come on and he is such a great guy. He has been unlucky with injuries but he has proven this season what an important player he is for this club. 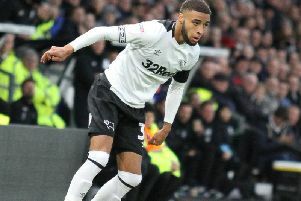 Derby now have three more home games in a row from which to try and gather momentum ahead of the final stages of the season, starting with in-form Sheffield Wednesday's visit on Saturday. Keogh said: “It is massive to keep going now. We have got 11 games left and this was the start of a four home game period for us which we got off to a good start.